One of the advantages of drinking from a glass is the large opening that allows more aroma, which dramatically impacts taste. For the host of situations where glass isn’t pragmatic or possible, Open Mike is the answer. (San Diego, CA) – Today Mike Hess Brewing (MHB) introduced its Open Mike™ beer can, becoming the only brewery in California to use Crown Holdings Inc.’s patented 360 End™ technology. A simple pull tab removes the entire top end of the can, effectively turning the can into an instant pint glass. “We could not be more excited to debut this breakthrough can design. For outdoor enthusiasts like me, Open Mike lets us experience the beer wherever we go, whether that’s at the beach or pool deck, stadium parking lot, or anywhere in the great outdoors and without the disadvantage of a standard can’s small opening. Craft beer, technology and the active lifestyle come together quite nicely here,” explained the brewery’s founder, Mike Hess. The new cans and ends are fully recyclable and better for the environment than glass. As an added bonus, Open Mike™ ends use 10% less aluminum than other ends, so the switch also helps MHB’s overall sustainability initiative. In addition to the Open Mike™ cans, MHB will be introducing their flagship 16 oz. canned beers in boxed six-packs. “Open Mike six-packs will be available as early as November 1st wherever Mike Hess beers are sold, including Southern California and the greater Phoenix, Arizona, markets. 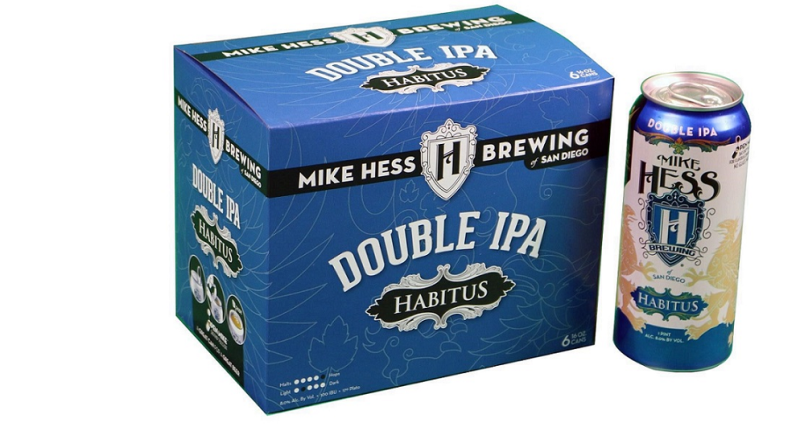 The first brand to feature the new packaging and Open Mike™ ends will be Habitus®, Double IPA, World Beer Cup gold award-winner in the Rye Beer category. “The boxed six-packs give our fans and retail partners 50% more beer than our current 4-packs in a familiar, approachable package branded to help identify Open Mike cans,” said Mike Hess Brewing’s National Sales Director, Greg Hess. MHB will continue to use 16 oz. pint cans produced by CROWN Beverage Packaging North America, the manufacturers of the 360 End™. The cans themselves are made with 72% recycled content. Open Mike™ cans hit shelves November 1st, 2015. Mike Hess Brewing is one of the premier craft breweries in San Diego, and has experienced rapid growth, doubling in output each of the last three years, growing from the region’s smallest brewery and original nano to its 12th largest. MHB’s world-class production brewery and tasting room is in the heart of San Diego’s North Park (recently named one of the hippest neighborhoods in the U.S. by Forbes magazine); they also operate a small pilot brewery in the Miramar area as well as a tap-room in beautiful Ocean Beach. The Mike Hess Brewing Odyssey blog, started in 2009, has become the de facto manual for opening a nano-brewery and is widely read across the nation and abroad and has inspired and helped launch hundreds of nano-breweries across the country. Mike Hess is recognized as the national expert on nanos, and has spoken on the topic at the AHA’s National Homebrew Conference, Beer-Con, and multiple times at the California Craft Brewer’s Association’s regional conferences. Visit www.mikehessbrewing.com.